Class I (easy): Fast moving water with riffles and small waves. The river has few obstructions which are all obvious and easily missed with little training. The risk to swimmers is slight and self-rescue is easy. Before you opt for the sports, ensure that you have enough money to pay for the same. Or else, you can trade online the digital currency to earn quick money. Bitcoin loophole, one of the most popular trading software can trade on your behalf and earn money. Go through the bitcoin loophole review here. Back to reading the river classification. Class III (intermediate): Rapids with moderate, irregular waves which may be difficult to avoid and which can swamp an open canoe. Complex maneuvers in fast current and good boat control in tight passages or around ledges are often required. Large waves or strainers may be present but are easily avoided. strong eddies and powerful current effects can be found, particularly on larger volume rivers. Scouting is advisable for inexperienced parties. Injuries while swimming are rare and self-rescue is usually easy but group assistance may be required to avoid long swims. Rapids that are at the lower or upper end of this difficulty range are designated “Class III-” or “Class III+” respectively. 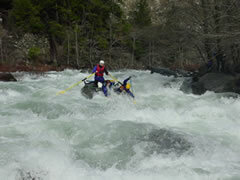 Class IV (advanced): Intense and powerful but predictable rapids requiring precise boat handling in turbulent water. 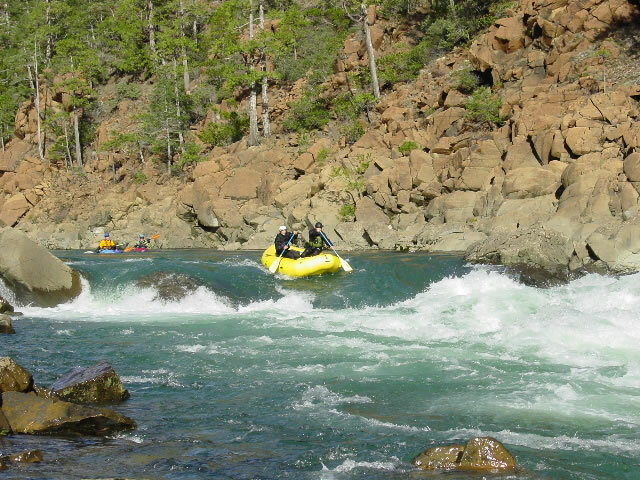 The rapids may feature large, unavoidable waves and holes or constricted passages demanding fast maneuvers under pressure. A fast and reliable eddy turn may be needed to initiate maneuvers, scout rapids, or rest. 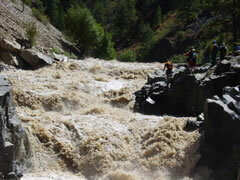 Rapids may require mandatory moves above dangerous hazards. Scouting is usually necessary the first time down. The risk of injury to swimmers is moderate to high and water conditions may make self-rescue difficult. Group assistance for rescue is often essential and requires practiced skills. A strong eskimo roll is highly recommended for kayakers. 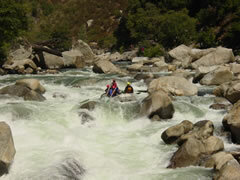 Rapids that are at the upper end of this difficulty range are designated as “Class IV-” or “Class IV+” respectively. 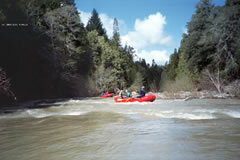 Class V (expert): Extremely long, obstructed, or very violent rapids which expose a paddler to added risk. 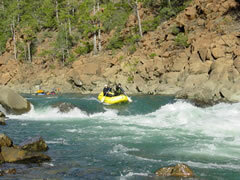 Rapids may contain large, unavoidable waves and holes or steep, congested chutes with complex, demanding routes. Rapids may continue for long distances between pools, demanding a high level of fitness. The eddies that exist may be small, turbulent, or difficult to reach. More difficult Class V rapids may combine several of these factors. Scouting is recommended and may be difficult. Swims are dangerous and rescue is often difficult even for teams of experts. Proper equipment, extensive experience, and practiced rescue skills are essential. There is a large range of difficulty that exists beyond Class IV which makes the difficulty of Class V rapids very diverse. Class VI (extreme and exploratory): These rapids have rarely been attempted and exemplify the extremes of difficulty, unpredictability, and danger. The consequences of errors are very severe and rescue may be impossible. These rapids are for teams of experts at favorable water levels. After a Class VI rapid has been run successfully several times, its rating may be changed to Class V.